Earlier this year I was at HPE Discover in Las Vegas and talking to Calvin Zito (HP Storage Guy) about the latest IDC Storage Tracker results. Calvin posted on the Around The Storage Block blog, covering details on both servers and storage. 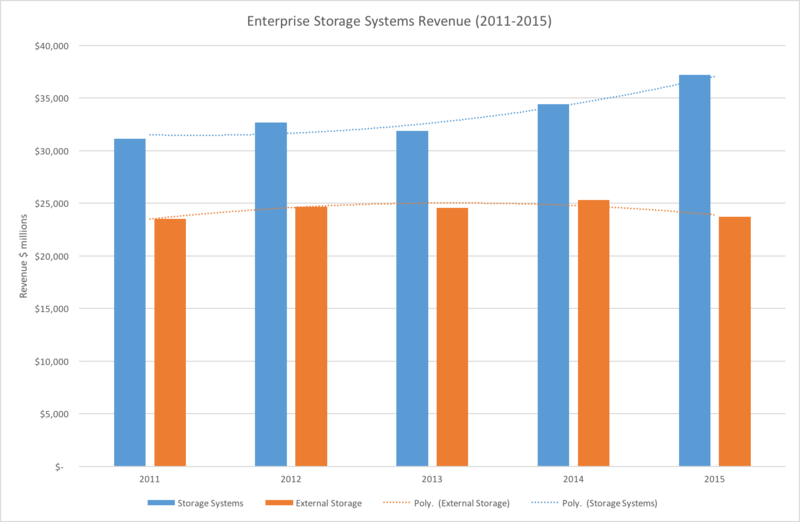 He highlighted the fact HPE was now ahead of EMC in terms of total Enterprise System Storage sales. 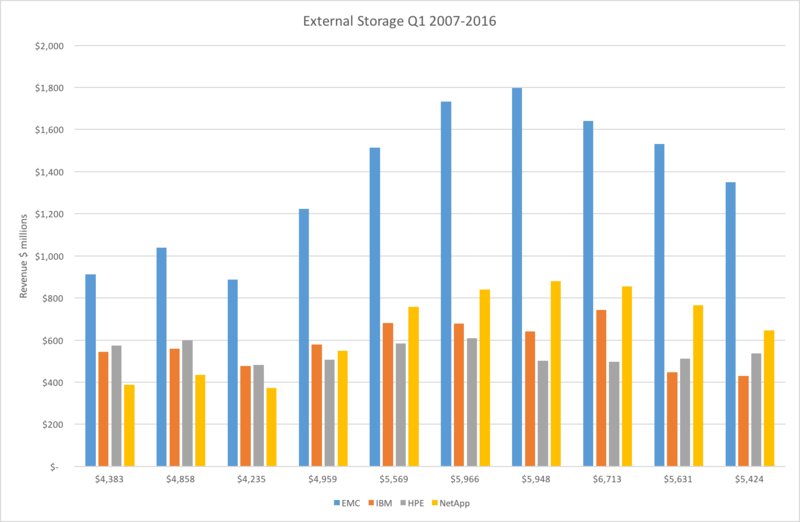 Note that this isn’t external storage array sales (HPE’s numbers are smaller there), but the category that tracks servers sold with storage. 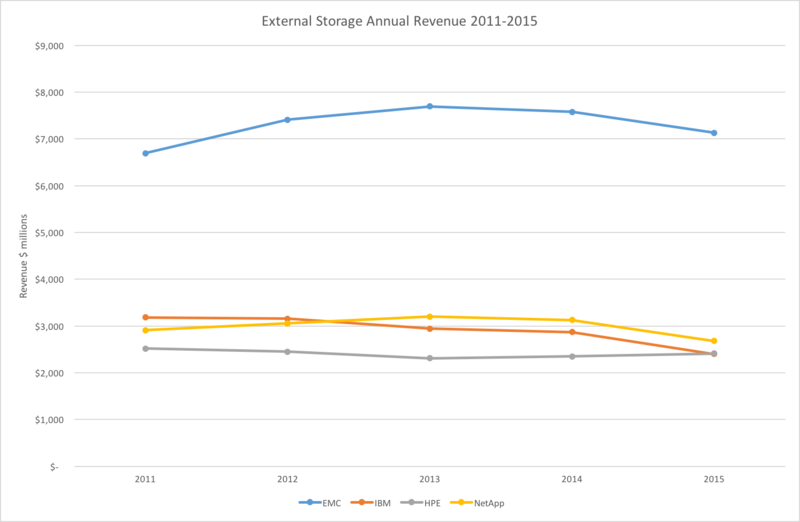 I was curious to see whether the total size of the storage market had changed over recent years, as I suspect that total market size (in terms of revenue, rather than storage capacity shipped) was pretty flat. 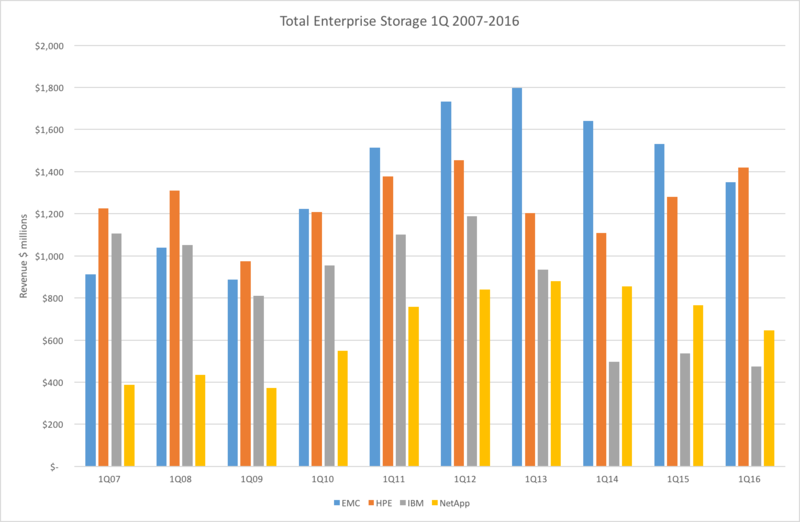 To check this out I’ve been doing some analysis of IDC’s Worldwide Quarterly Enterprise Storage Systems Tracker data. IDC tracks an estimate of the revenue for each major vendor and a total market value, based on vendor provided data and customer feedback. Disclaimer: the data I’m presenting has been compiled from a range of sources, so I can’t guarantee the full accuracy of the data, or the fact I may have made translation errors as I copied information over to Excel. In addition, the data isn’t complete in certain categories (e.g. where vendors aren’t individually itemised) so some information is abridged or omitted. So far, I’ve managed to find complete data from 1Q2011 to 1Q2016. I’ve also found some data for 1Q 2007 to 2010. 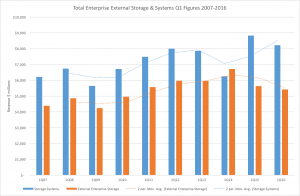 For each of these date ranges, I have two metrics – the total Enterprise Storage Systems figure (remember that included servers & storage) and the External Enterprise Storage – storage hardware. Here are the results. The Q1 data is the most complete I have, so plotting these on a graph for both categories shows the results in graph 1. 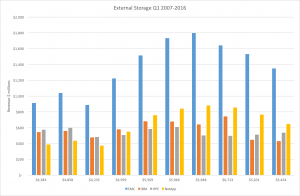 The trend lines show an increase in the market for storage systems, with a decrease in the market of external storage arrays. I guess that isn’t particularly surprising, we know the market for external arrays is declining, while that for SDS-based solutions is increasing. If we turn to the individual vendors (graphs 2 & 3), we see some interesting results. EMC rules the roost with the largest revenues, until 1Q16 for Enterprise Systems. HPE seems to be making good headway and presumably will significantly overtake EMC on trend. EMC’s figures show a significant trend downwards with both values (external and systems) being almost identical. IBM’s business had nose-dived and NetApp are also on the decline. In the early years on these graphs I would have expected EMC’s external and total figures to be the same, after all, EMC doesn’t sell servers directly. However what I do find intriguing about these graphs is how SDS-based solutions and hyper-converged are being interpreted. The implication from these figures is that either EMC doesn’t sell any (or very little) SDS solutions with hardware or the figures aren’t included. 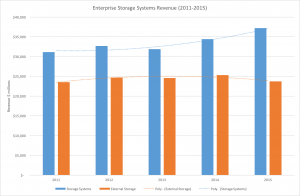 I’d think the latter, however that could be challenged when looking at HPE’s increasing figures for Storage Systems – what is that capacity being used for? One other point of note is EMC’s declining external business, which should now represent a significant amount of all-flash sales. 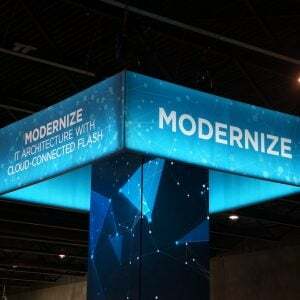 If all-flash is growing at such a tremendous rate, does that mean the traditional array and other products are on a massive decline? Moving over to the annual figures, I’ve totalled up the quarterly values from 2011 to 2015, the years I have the complete data for. These show (graph 4) an increasing systems market and a slightly declining external market. 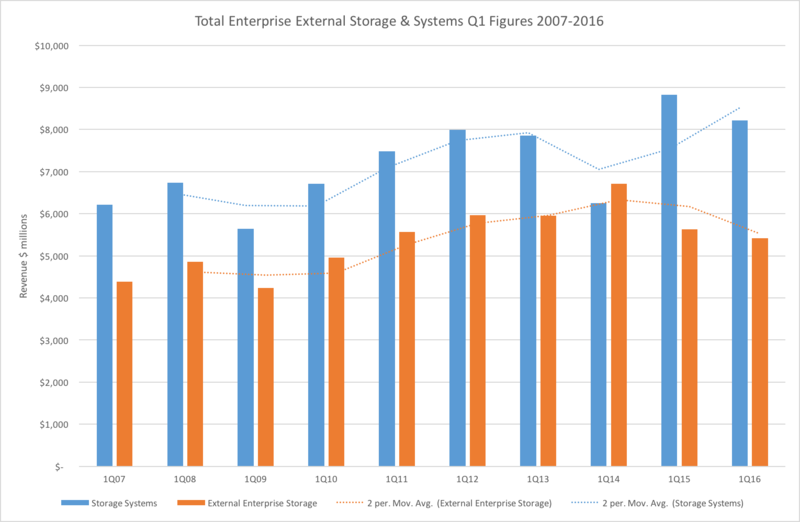 Now both of these trends are open to interpretation and aren’t adjusted for inflation (which I think would be negligible), but it’s clear that for external storage systems at least, this isn’t a massive growth market any longer. Looking at individual vendor figures (starting with graph 5, Enterprise Systems), we see EMC has peaked, HPE is in recovery, IBM is in free fall, Dell looks to be recovering and NetApp is on a slight decline. 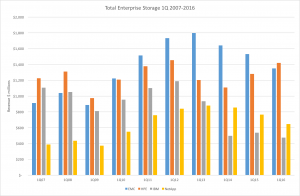 For the External storage figures (graph 6), all vendors are on a decline, except for HPE. Note that I’ve had to exclude values for Hitachi and Dell here, as their data isn’t explicitly mentioned in each quarter as both vendors drop in and out of the “other” category. The data from IDC, while being only one reference point, does actually provide some interesting views on the direction of the market. As an individual category, “External Storage” is becoming increasingly niche, as organisations adopt hyper-converged and SDS solutions. The traditional array vendors are having to adapt to the changing market and derive more business from other sources because this source of revenue looks flat or declining. 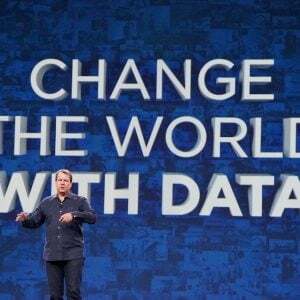 Competition for external arrays has increased significantly, with many more startups fighting for business, especially with all-flash solutions. 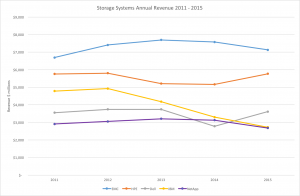 Total hardware revenue from storage systems does appear to be increasing, but these figures don’t provide any idea of how much the storage software market is growing. 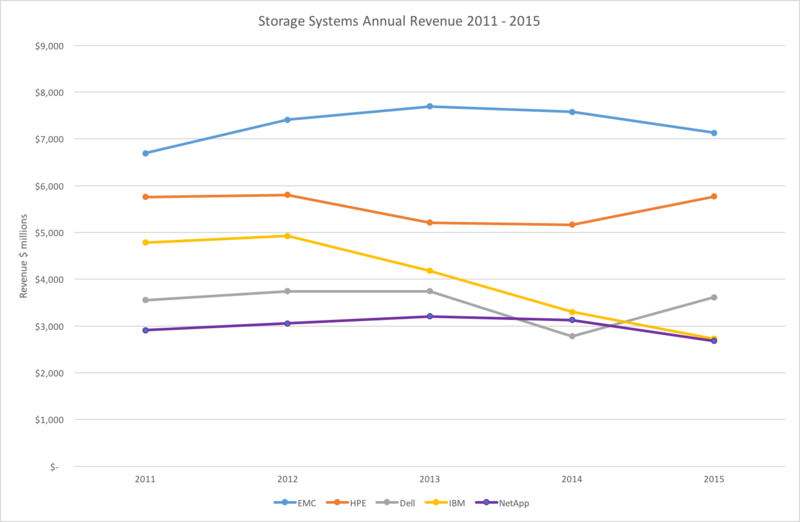 There must be another layer of revenue on top of the Storage Systems figures that accounts for the money made in selling the software, but how big this part of the market is, is anyone’s guess at the moment. 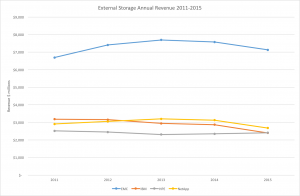 The fascinating part is that tracking by hardware sales will become less relevant a measure for the success of storage companies that diversify into storage and as a measure of the health of the market as a whole. It’s going to be interesting to see how the major analyst firms adapt their models to take into consideration a much more diverse industry. Keeping track of who’s winning and losing in storage just got a whole lot more complicated.